Welcome to Bikeshop Playground, a blog about bicycling, workshops and other things we shouldn't take too seriously. Let me tell you a little bit about myself: you know the guys who spend $4,500 on a bike frame and shave their legs so they can go 0.01% faster? The cyclist with a BMI of a whippet? The triathlete with his local bike shop on speed dial? 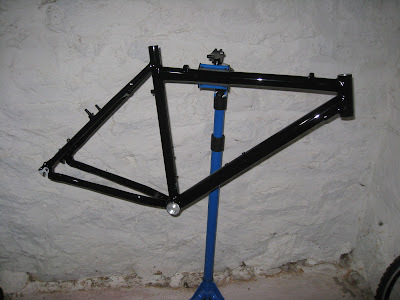 I admit I'm enthusiastic about cycling, but I have trouble measuring that enthusiasm with money or component lust. I favor bikes I can afford and bikes I can work on myself. I've also had a long history favoring modes of transportation that are a bit different from the others. One of the bikes I own and ride regularly in fact is - and I'm disclosing this now to weed out the Snobby Cyclist demographic - a recumbent. It's the one pictured in the header. I bought it from a guy who owns a tattoo shop in Greenwich Village and I actually had to walk through the shop - past some clients currently getting inked - to retrieve it. Since owning a recumbent is considered an act of treason by the Cycling Community (and the bike dates back to the Reagan Years anyway) I had trouble finding anyone willing to repair it. I made a point to frequent bike shops that would wait until after I left the shop before laughing at me. Even when I did find a bike shop willing to work on the recumbent, they'd complain about its minor personality quirks (i.e. - it once took three employees to take the 27" wheel off to true it) after I had settled the bill. So I worked on the bike myself, and as I acquired more bikes and more tools, I found myself going to a bike shop less and less but I was enjoying myself more and more. I learned how to true wheels and am learning how to weld. In true man fashion, however, I'm forever tweaking my workshop (just as much, if not more, than working on bikes themselves). However, I've been able to work on several interesting projects, one of which starts with the naked, black alumninum frame you see here. When I wasn't working on bikes or working at my day job I was trying to find ways to insert bike riding into my life more, and one of the ways I've done that is traveling from my home in Stamford, Connecticut and renting bikes. 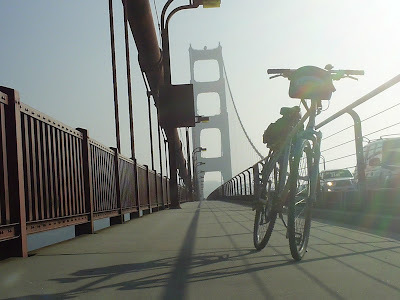 Some of those travels will be featured on this blog, and as you probably guessed one of the destinations was San Francisco, where I rented a bike from Bike and Roll so I could ride across the Golden Gate. As this blog is still in a bit of a zygote stage and my interest in travel, riding, and building things take many forms, I'm not sure what direction this blog is going to take, but I hope you hang around and check back often to find out. Thanks for the visit!